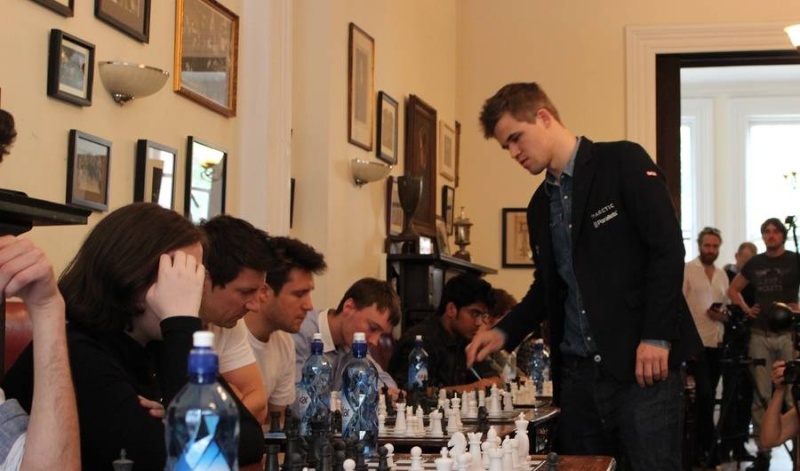 International chess champion Magnus Carlsen leaned over the 12th chessboard in a long line of half-played games at the Marshall Chess Club in New York City. He stared down at the pieces for a few seconds before swiftly moving a pawn forward. In that short time span, Carlsen's brain racked through thousands of previously played games, moves and choices. He subconsciously sifted through patterns and strategies learned from countless books and lessons to make a snap decision. Years of practice will do that to you. "The thing that helps you improve the most is just playing, practicing, playing tournament games, playing games online," Carlsen told Mic. "Practice is your intuition, practice is your calculation, and practice is everything." Carlsen, 24, has the highest chess ranking ever recorded. He has remained the world No. 1 ranked chess player since 2011, won the World Chess Championship in 2013 and is the youngest chess player ever to win those titles. While Carlsen's achievements are exceptional, he's not the only one whose brain has benefited from playing chess. Studies show that the brains of people who play chess are significantly different than an average brain. For example, grandmaster chess players have more activity in their frontal and parietal cortices, areas of the brain that focus on problem-solving and recognition. Children who took chess classes for 18 weeks had higher IQ scores afterward. 1. Playing chess at a young age can help develop advanced math and critical thinking skills. Studies show that playing chess as a kid has a high positive correlation with academic achievement. In one study, researchers found that students who were taught how to play chess were more academically advanced overall, especially in math, spatial analysis and nonverbal reasoning ability. 2. Chess can shrink your brain — which is actually a good thing. In a study where researchers scanned the brains of elite chess players, they found that these players actually had smaller brains than the non-elite players — and that's not a bad thing. As Christian Jarrett writes in Wired, their research suggests that areas of brain shrinkage "can be a sign of neural efficiency and a reflection of behavioural expertise" as opposed to a negative result. Bigger is not always better. 3. Advanced chess players use both sides of the brain. Scientists analysed patterns of the brains of elite chess players and found that more advanced chess players used both sides of the brain while making decisions during games. By exercising both sides of the brain, players are using the more visually focused right side to recognize patterns from games past and the analytical left side to decide what is the best logical move. This exercise strengthens both sides of the brain, making the player a more advanced and adept thinker. 4. Chess teaches you to think in patterns. In 1996, researchers Fernand Gobet and Herbert Simon analysed then-world chess champion Garry Kasparov while he played a simul, a series of chess games played at once. In the study, they concluded that Kasparov relied on "memory and access to memory through recognition of clues" in order to play and win multiple games at once. Grandmaster chess players who practice and play consistently are able to recognize patters on the chess board and use those patterns and memories from previous games to play. 5. Playing chess teaches you how to think like a computer. Matthew Berland published an article in the Entertainment Technology Centre at Carnegie Mellon University concluding that people who play strategic board games, like chess, train themselves to think more like computers. Berland finds that playing strategy games requires people to engage in "computational thinking," where "players follow a set of relatively uncomplicated rules with a few decision points for which players have voluminous data." 6. Expert chess players are expert problem solvers. In a study conducted by researchers at the University of Konstanz in Germany, researchers found that grandmaster chess players use the frontal cortex of the brain when making moves in a chess game. The frontal lobe is an area of the brain associated with problem-solving, suggesting that these players were drawing on previous memories to recognize patterns and make decisions. In comparison, the amateur chess players used the medial temporal lobe of the brain, an area focused on learning new long-term memories. 7. Playing chess at an older age can help prevent Alzheimer's disease. In a study published in the New England Journal of Medicine, researchers found that people over age 75 who play chess or other strategic board games have less of a chance of developing dementia or other memory loss conditions.